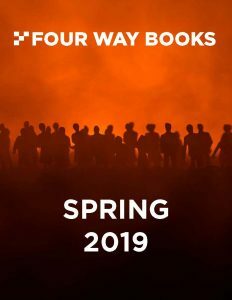 For news about Four Way Books and our authors, like our Facebook page (click HERE) and follow us on Twitter (click HERE) and Instagram (click HERE). Click on the cover to download a pdf of our most recent catalog. Thank you to The Jerome Foundation for awarding us a generous grant in partial support of the 2018 publication of poetry books by three emerging New York City poets: Blue Guide by Lee Briccetti, No Small Gift by Jennifer Franklin, and For the Love of Endings by Ben Purkert.